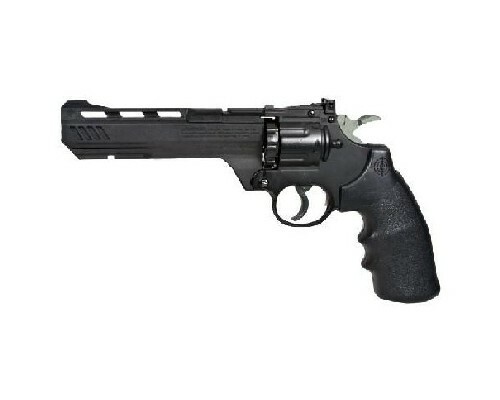 The Vigilante is a single and double action, semi-auto revolver that shoots pellets and BBs. The Vigilante has a fixed blade front sight and a fully adjustable rear sight. Use the dual tactical accessory rails (one on top, one on bottom of barrel) to mount a scope, laser, or flashlight for the ultimate backyard plinking air pistol. Comes with both a 10-shot pellet magazine and a 6-shot BB magazine. up to 465fps with BBs.